Cabinet refinishing workspace with doors. 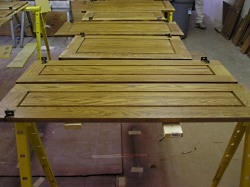 Most people think of preparation as the steps leading up to the actual refinishing process. It needs to include more. Far too often, homeowners who want to save by doing it themselves fail to consider other factors they need to consider as part of the preparation process. One of the biggest considerations is “Where am I going to do this?” Most stripping and refinishing products use strong solvents that require good ventilation. Most people find they like to work in their garage, but if you aren’t so fortunate as to have a garage, you’ll find refinishing is a lot easier if you can free up a large, well-ventilated room. While there are new natural citrus strippers on the market that work very well and smell quite pleasant, it is still a good idea to work in an area where there is an exchange of air. Another consideration is the fact that you’ll get the best results if you lay your doors flat during the refinishing process. While you can’t do this for the cabinet faces, it is far easier to achieve drip-free results when you can stain or paint doors when they are laying flat. It can be easier to see whether the finish is even as well. Wherever you decide to set up your working area, sawhorses are handy for placing the doors and drawers at a comfortable working level. It is easy to make sawhorses. If you’re on a budget, just use five-gallon buckets and long pieces of wood 2×2s. There are metal brackets for inserting 2×4s as well that create instant sawhorses. If you can afford them, you’ll find that drying racks are even better. They are portable and take less space. The more space you have to work in, the faster you’ll be able to complete your refinishing job. 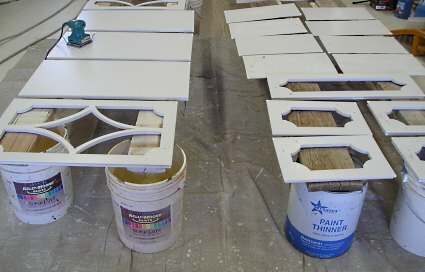 It’s very important to allow stain, paint or varnish to dry thoroughly between coats. This means you can only do one side of the doors at a time. The more space you make, the more doors and drawers you can work on at a time. Good article. We do a lot of kitchen cabinet refinishing jobs. Probably close to 100 kitchens a year. We spray the doors with oil base paint, 1 by 1, in a make shift spray booth and transfer to a drying room. For our drying racks we use 4 tier shelves with 2 x 16’s and have furniture pegs every foot in distance to protect them as they dry.